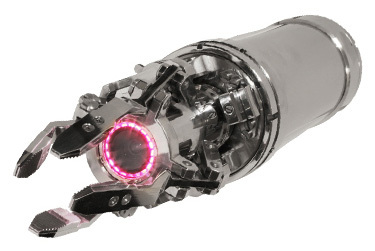 Diakont’s radiation-tolerant Foreign Object Removal System (FORS) provides the ideal solution for your nuclear power plant’s Foreign Object Search and Retrieval (FOSAR) needs. Diakont’s FORS complements your station’s FME program within reactor cavities and spent fuel pools by providing reliable tooling for identifying and retrieving foreign material that, left within reactor components, can cause catastrophic damage to system integrity and plant safety. Designed with a compact chassis, this system is ideal for difficult-to-access locations such as fuel top and bottom nozzles, near the core plate, refueling cavities, the BWR annulus, and more. Featuring an integrated Diakont’s D40 camera, Diakont’s FORS utilizes various gripper head attachments to scan, locate, and remove foreign material. The FORS is available with either a cable or a pole to support various extraction scenarios. The pole deployment option provides increased stability for difficult applications. Diakont’s FORS employs a modular design that accommodates various gripper types, supporting the operator’s ability to select the most efficient configuration for extracting specific foreign objects based on their shape. Interchangeable gripper types include a front gripper, bucket gripper, reverse gripper, and a parallel plane gripper. The tool also utilizes an electric gripping mechanism that is equipped with safety springs, preventing the grippers from unclenching even in the event of a power loss scenario.